Interlocutor: Master, now I would like to continue with the topic related to a mysterious disappearance of a large lake in Southern Chile, which has baffled geologists. Ruanel: There was a small earthquake in April, which opened small cracks that failed to absorb the water from the lake. Beings from Bellatrix came and they extracted the water which was transported to a mother ship, which had a huge tank, the water had terrestrial bacteria. I have said on several occasions, and this is important to clarify- that if certain aliens need water, they can get it easily from the pure ice in satellites in different orbits of the solar system. The logical question would be: Why didn’t they get water from these satellites? And the answer is precisely because they needed for study the bacteria contained in the water lake since they cannot find bacteria in the pure ice. Ruanel: Then, they transported few tons of water to the ship, with a beam of energy and they cause another small earthquake, which caused a greater opening in the crust where the lake was over and finally all the water was drained through that crack. Interlocutor: But why did they do that? Ruanel: To conceal their intervention. Interlocutor: Only for that reason? Interlocutor: How much water they took? Ruanel: Only four tons. I repeat the topic to make it clear: Back in April there was a small earthquake in May those aliens caused another earthquake that opened a crack in the bottom of the lake formed by glaciers and the remaining water was absorbed, leaving ice formation due to the icy weather. Interlocutor: Are these aliens those who abducted the plane that was going to hit the Pentagon? Interlocutor: Other lakes on our planet have also disappeared in the same way? Ruanel: Yes, of course, but directly these incidents have not been taken into account. In southern Chile have also disappeared amazing bodies of water and they didn’t notice. Interlocutor: Just out of curiosity. How many tons of water can carry these mother ships? Ruanel: In this type of ships, ten tons. Interlocutor: Well, this topic is over because it’s clear enough. Interlocutor: Well, Master, I wanted to ask you about a very old topic I had scheduled. The famous “Foo Fighters.” I’ll read a summary for the record and then you will answer my questions. Ruanel: You are taking advantage of this vessel. Interlocutor: Ha ha! And so are you! (joking) The name “Foo Fighters” comes from a mispronunciation of the word feu (fire) from the French. This term would be translated as “jets of fire.” The aviators of the Second World War used this name referring to a certain phenomenon regularly sighted during aerial combat missions. These objects were described usually as glowing spheres or balls with metallic appearance that appeared individually or in groups. Although they were often persecuted or they accompanied military aircrafts, there are no records that any “Foo Fighter” has ever tried to make some kind of attack or interaction. The “Foo fighters” were characterized by their high speed and maneuverability beyond the physical possibilities developed at that time. The accounts reveal that they could accelerate or decelerate instantaneously or remain stationary, like hovering. 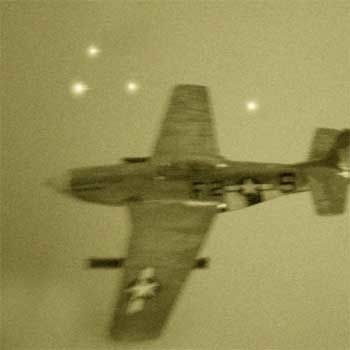 The Foo Fighters were spotted by military pilots from the British, American, German and Japanese armies. The Allied pilots initially thought that they could be some kind of secret weapon of the Nazis. On the other hand, the Nazi leaders thought that they were a secret weapon of the Allies as well. It is said that both sides investigated the phenomenon and they abandoned any investigation when they realized they were not a threat. I listen to you, Master. Ruanel: You already know what they were. At least I read it from your mind. They were observer alien ships. Interlocutor: Were they unmanned ships? Ruanel: …Silly war, as you say and they were so disappointed of the behavior of the allegedly more coherent inhabitant of Sun 3, so that they didn’t even bother to use an energy field in order to conceal their presence. Interlocutor: Now I see, where did they come from? Ruanel: They came from a very distant stellar system. And they have nothing to do with anybody related to Area 51. Interlocutor: Can you tell me the name of the planet they came from? Ruanel: It’s a system, which is located at 740 light years away, and they have often visited Sun 3, but they don’t interact. Interlocutor: Okay. Is this the whole story? Interlocutor: The funny thing is that these artifacts didn’t return. Ruanel: Yes, They did return. Of course they came back. Interlocutor: Ah, Okay. How come they weren’t detected as the “Foo Fighters”? Ruanel: Because they returned camouflaged with energy fields that covered them up. Interlocutor: Master, I have a question rather delicate to ask you, I don’t know if I’ll do, Do you know what I’m referring to? Ruanel: Please ask the question. Interlocutor: Perfect. There are suspicions that there are aliens infiltrated among us, one would wonder how they do in order to pass unnoticed among us. You know that Nikola Tesla was extraterrestrial and he passed unnoticed, but I’d really like to know if there are aliens living among us and if they are infiltrated or not in order to dismiss this theory completely, I personally believe that there is no such infiltration, unless in certain cases or sporadically for example. Ruanel: You know what your mistake is? Whenever we talk about aliens you all think about Greys, when there are a high percentage of Homo Sapiens in many planets where there is a suitable atmosphere, quality conditions or a life support for your race. Interlocutor: Okay like Nikola Tesla, I don’t know if he knew that he was alien, Did he? Ruanel: No. He didn’t know it. Interlocutor: Would there be many aliens like Nikola Tesla on the planet? Interlocutor: But his intelligence came from his Spirit plus his mental decoder. Ruanel: Exactly, even if the Spiritual or superphysical Entity has so much intelligence, remember that there must be a suitable mental decoder in the embodied being as well. Interlocutor: Okay that's perfectly clarified Master. Don’t forget to answer my question if there are aliens living among us. This is very important, because if there are 10 or 20 they would be like non-existent. How many are there? 100,000 perhaps? Ruanel: No, much less They might be 8000. Interlocutor: 8000 aliens distributed worldwide? Ruanel: Yes, and some of them have political positions and some others economic power. Interlocutor: And Where do they come from? Ruanel: They come from different planets, not from a single planet. Interlocutor: Are they "conspiring" or they simply live like tourists? I mean if they are deliberately infiltrated with other plans. Ruanel: I understand, they didn’t come like babies, but directly they came with an average age of 25 or 30 years, being adults they have come to make a fortune and have economic power. They are not looking to seize any government for the moment, but since they have more advanced knowledge, they have the potential to be in key positions. Interlocutor: Do they have meetings like a conclave as the Freemasons do, for example? Ruanel: No, not necessarily, because it seems very clumsy to raise suspicions. They can meet perfectly on a bench at Central Park in Manhattan, 10 or 12 people just walking as if nothing happened. Interlocutor: Do they meet from the standpoint of their race or just for entertainment? Ruanel: They gather from the point of view of their planet or race, at this moment there are 6 friendly and compatible races that directly are planning to take over positions of power. Interlocutor: Is it something we should be afraid or not? Ruanel: No, not for the moment. Interlocutor: Well if you agree, we’ll conclude here and we’ll follow in the next session. This entry was posted at Saturday, March 03, 2012 and is filed under Extraterrestrials, Mysteries and Enigmas . You can follow any responses to this entry through the .